"Mercuriales: merchants and learned men. 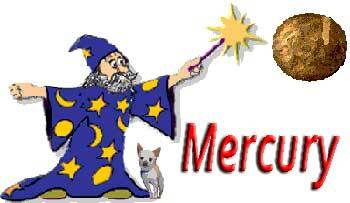 As under the protection of (Mercurii) Mercury. *Jamieson: 'Rudbeck thinks that the different attributes of Mercury, as the father of letters, the god of money, the inventor of geometry, of astronomy, of numbers, of weights and measures, and of merchandise, may all be traced to Goth. merkia which signifies to cut on wood, to enumerate, to strike metals, to affix limits, and to distinguish the heavenly signs.'" As for "distinguish(ing) the heavenly signs" - prior to the new kid on the block, Uranus, being discovered in 1781 - the planet Mercury was the traditional ruler of astrology and astrologers. Whenever things seem fixed, rigid, 'stuck,' Hermes introduces fluidity, motion, new beginnings - as well as the confusion which inevitably precedes new beginnings." According to archetypal author Jean Bolen, in ancient Greece there were two standard fixtures every home was virtually guaranteed to have. Standing at the front door was a "herm," a pillar consecrated to the god Hermes - and in the center of each home was a cooking/heating hearth dedicated to the Virgin goddess Hestia. Is there perchance a deeper archetypal connection between these two seemingly very different, contrasting Olympian gods Hermes and Hestia - with Hermes (Gemini) forever the traveler on the move and the virgin goddess, Hestia (Virgo) being the "stay at home", center of warmth and wholeness? Are they perhaps flip sides of the same proverbial coin? Is this one of the reasons why the planet Mercury is traditionally considered to be the ruler of the two very different, contrasting zodiac signs, Gemini and Virgo?